1.Single Phase(Net Meter) 5-30A, Class1.0. 2.Single Phase(Generation Meter) 5-30A, Class1.0. 3.Three Phase (Net Meter) 10-60A, Class 1.0. 4.Three Phase (Generation Meter) 10-60A, Class 1.0. 5.Three Phase LTCT Net Meter, 10-60A, Class 0.5s. 6.Three Phase LTCT Generation Meter, 10-60A, Class 0.5s. 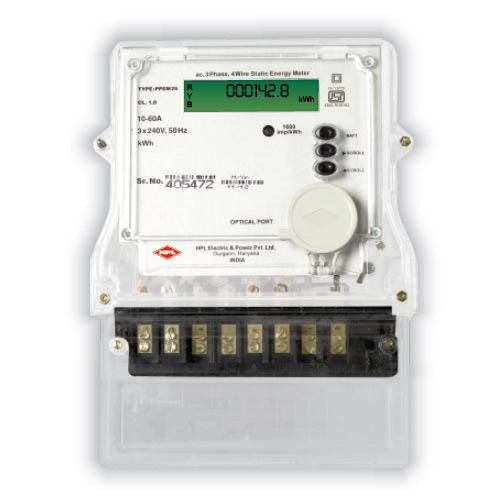 3.Three Phase (Net Meter) 10-60A,Class 1.0. 4.Three Phase (Generation Meter) 10-60A,Class 1.0. 5.Three Phase LTCT Net Meter, 10-60A,Class 0.5s. 6.Three Phase LTCT Generation Meter,10-60A,Class 0.5s. Delivery Time Mostly Available Ex-stock. 2012-13 Rs. 1-2 Crore Approx. We have been engaged in trading technologically advanced array of Electrical Testing Equipment and Meters. The products offered by us include Diagnostic Insulation Tester, Clamp Meters, Cables Jointing Kits and Energy meters, Temperature Measuring Instrument, Multimeters etc. Since, the products are procured from reliable vendors of the market, these are manufactured using high grade components and latest technology. The entire range is well known among the customers for its salient features such as compact design, low maintenance cost, easy usage and accurate reading, meeting the demands of numerous industries. We are supported by a sound and large warehousing unit, which sprawls across a vast plot area. This unit helps in the organized storage of our products in bulk quantity. Moreover, we have recruited expert professionals, who look after our entire business activities in an efficient manner. They assure that the products are tested on well-defined parameters and packed properly, before the final dispatch. It is owing to their untiring efforts and wide distribution channel, that we deliver the orders at client's premises right on time.